Happy Onam to all of you! The festival of Onam is one of the most popular and a major festival celebrated originally in the Indian State of Kerala and Tamil Nadu which is now celebrated by Malayalis all over. 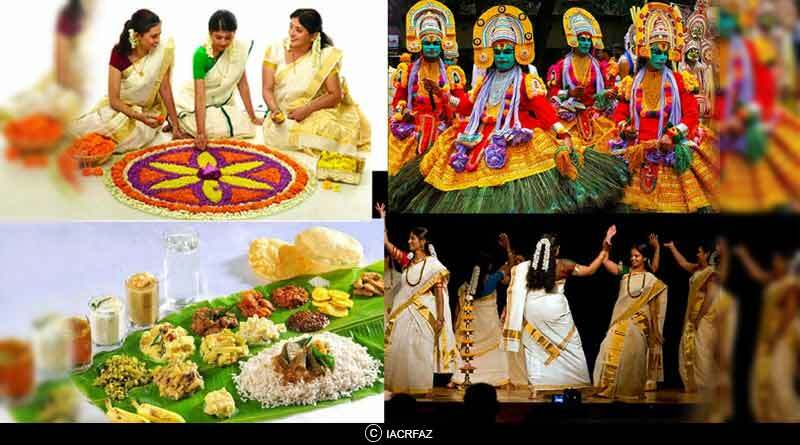 It is celebrated in the Chingam month of Malayalam calendar which falls between the months of August- September according to a Gregorian calendar for ten days, the first-day Atham and the last day Thiru Onam are celebrated with most pomp and show with people wishing Happy Onam to each other. 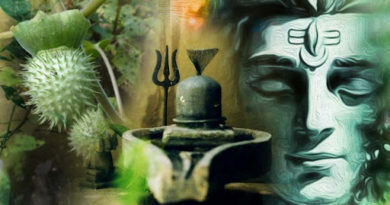 Since most of our festivals celebrate the arrival of God, Avatar of God or other mythical characters, to be able to welcome the gods the first thing that is ensured is cleanliness therefore like any other celebration, the celebration of this festival begins with cleaning of the house or workplace. The people wear new clothes, make rangolis made with flower known as Pookkalam, offer prayers, exchange gifts and enjoy a feast. The first day begins with an early bath and making Pookkalam, as the days pass it grows larger and larger, as flowers are added to it for the following days, making it massive by the tenth and final day. It is generally made by women of the house while men do other chores. The traditional feast of Onam includes 26 special dishes served on a banana leaf on the floor which includes sambar, rice, coconut chutney, rasam, and other delicacies. Some households also like to decorate their trees and hang swings with flowers for their children and themselves to enjoy. They sing traditional songs and prayers while they swing and make most of the ten days festival. The ninth day, Utradam is crucial as the preparations for the final day are carried out on this day. Some of the joint families that are so big that there are about hundred members in the family and all their meals are prepared at one place, these families are called as ‘Tarawads’ and the eldest member of the family, Karanavar, is presented with various presents by their dependents and other people. Since this festival also celebrates the ‘harvest’, many of the presents given include the harvest from their own fields like fruits, dry fruits, sweets, coconut oil, grains etc. The presents given are collectively called as ‘Onakazhcha’. The Tenth day is celebrated with a gay spirit, with cultural showcase through traditional dances and country music. Many of the rituals and prayers performed on this day are also performed by the eldest member of the family, and the men altogether make a peculiar sound, ‘Aarppu Vilikkukal’ which depicts their joy and marks the celebration of Thiru Onam. The festival is then celebrated with some community game like Archery, Kutukutu ( Kabaddi in Kerala), and other games. The women perform their traditional dances like Kaikottikali and Thumbi thullal. Another royal way to celebrate Onam is by carrying out several Elephant Processions, which are meticulously decorated with gold and other colorful paints. 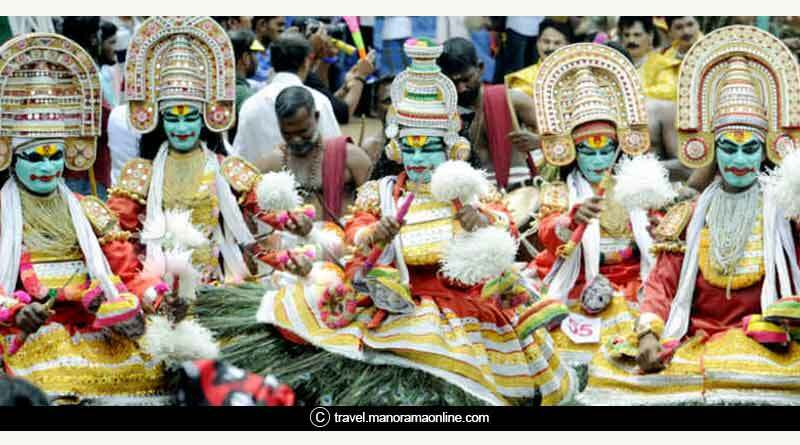 The Snake Boat event of Kerala or Vallamkali is known widely for its celebration and sporty spirit, celebrated in between the ten days, is a sight to see as many tourists visit Kerala especially to witness this event. This takes place in Alappuzha. Kerala is all full of high spirit and merriment with color, lights, processions, games, and fireworks to make Onam festivities Grand and festive. Happy Onam!